The acclaimed novelist and short story writer provides revealing answers about his childhood and life as a father. Craig Davidson's stories are eclectic. From boxing to werewolves, the writer is interested in exploring the unexpected. At the same time, Davidson isn't afraid to delve into grounded realities. His Canada Reads 2018 nominated book Precious Cargo was a memoir about driving a school bus for kids with special needs. 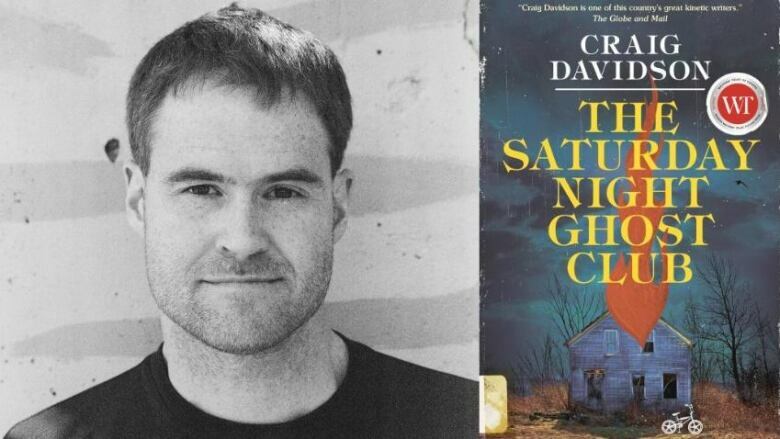 His most recent novel is a coming of age thriller called The Saturday Night Ghost Club. Below, Davidson answers The Next Chapter's version of the Proust Questionnaire. "Stephen King. He is certainly my biggest idol. He's certainly my biggest influence. I started reading him so early. My parents in another era might have tried to talk me out of reading Stephen King, but they were just happy enough to see me reading. They didn't really care so much what the content was. And, obviously, Stephen King was so popular in the 1980s. So that influences my work deeply. I've always felt it's like the way that a baby duck would imprint on the mama, and, to a degree, it's almost impossible to disassociate myself from that influence, whether I like it or not." "How long do you have? I think there's probably a lot of things about myself that have caused me some level of grief or issue over the years. I mean, I think I'm a people pleaser, which in itself is not an issue, I don't think. But it can get yourself in trouble, certainly in a career way when you're chasing somebody else's ambition or somebody else's goal that isn't necessarily yours. It becomes like chasing the heat shimmer on a highway. You're not ever going to catch it because it's somebody else's dream or their vision that you end up getting yourself co-opted into. I think, just on a personal level, I've certainly had issues with friends, even people who I care about, who know that I just simply am unable to carry a grudge." "Well, I know that writing is really the only thing for me, personally. Most days at least, when things are going well. I mean certainly, like a lot of kids, I nursed some kind of athletic hope. But at some point I realized I was a schlubby 18-year-old who, if basketball was my chosen endeavour, you would probably need some leaping ability. I couldn't jump over a pencil. I'm deeply glad and grateful that I was able to, at least to this point, make a living doing what I'm doing because I don't think that I am suited to anything else and I don't think the world is suited to having me as much else." "The journey as a father. Our son is six years old right now and it is the most mystifying journey I've ever taken. It has also taught me things about love and, maybe even more importantly, fear. The way those two things are intimately knit inside the brain of a parent." "I don't think perfect happiness is something that we should aspire to or even think about too much to be honest... I think you'll learn more about what it is to be a person, and to understand what it is to be a human, through the bittersweet moments rather than the ecstatically happy moments. Although I suppose we all want a few of those moments where it feels like everything is in order and there's a certain synchronicity to things that you feel like you're peering into some different layer of the universe. But, ultimately, you really can't understand the sweet unless you've tasted the bitter, or the sour or the tart. I've always learned more from the bitter and sour moments of my life than I probably have from the sweet ones." Craig Davidson's comments have been edited for clarity and length.